While most trend reports depict their trends as being the next new thing, really most trends come from ideas that have been around for a while, and have just been gathering steam. There’s very little that’s new in the world, especially in something as connected to natural rhythms as gardening, but everyone brings their own twist to gardening and so there are always innovations popping up that can turn solid concepts such as “low-maintenance gardening” or “sustainable gardening” into an actual trend that people would want to put energy into. 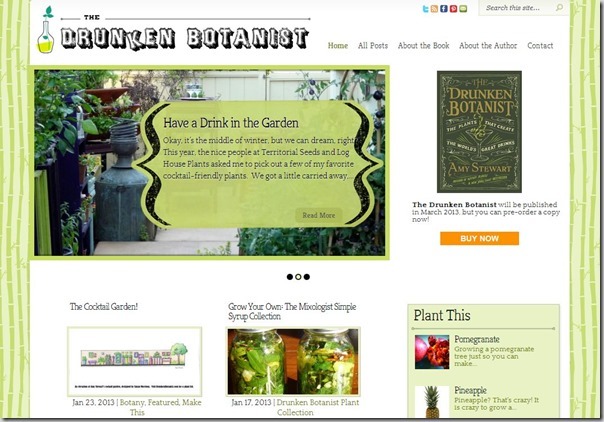 Here’s my take on which gardening movements are up-and-coming, still going strong, or starting to lose steam for 2013. Even the most passionate of gardeners still has to work, and usually that work involves us sitting in front of a computer or in an office all day. However, I can say from experience that having something beautiful and alive to rest our eyes on in between projects is not only conducive to creativity, but makes us feel great. There are a lot of elements converging to create this trend, from the beautiful air plant displays at Flora Grubb and other nurseries, the Wardian cases and glass terrariums that have been so hot, to the books about selecting unusual picks for houseplants, fairy gardening, and terrarium decor. I personally love this trend. There’s nothing like a little greenery to class up a joint, and I have a purple Crinum growing indoors, four air plants, and a cute little H. Potter Wardian case which I decorate according to the seasons. I’m a tool geek, so I’m always delighted to see new advances in ergonomics and other technology which makes it easier for people to garden. 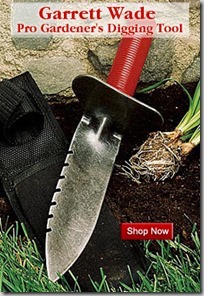 Now that many of the boomers are getting arthritis or just having some of the simple aches and pains of aging, we’re seeing an increase in garden tools which require less force to use, raised bed and patio gardening supplies which make it easier to garden without bending over or kneeling, and lots of tricks and techniques coming out about how to garden safer and with more ease. It’s not just the boomers who benefit from this trend. The tool advances help everyone, and a lot of those cool raised patio planters have a fresh, modern look that work well in both city and suburban gardens. 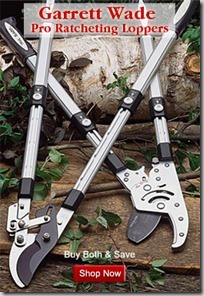 Some examples are those hand tools with the fat handles that are so easy to grip, ratcheting loppers which let you prune with less force, and telescoping hedging shears which make it possible to trim a small hedge from a seated position or a larger hedge without getting up on the ladder. 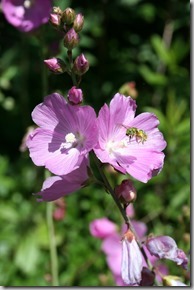 One of the main arguments of using native plants, which has been a strong trend/movement for the last two years, is that native plants provide unique habitat and support for our native insects. Many of our butterflies simply can’t reproduce unless they find the exact right variety of native plant that the caterpillars have evolved to eat. Plus, insects make up the base of our food chain, so if we want to see birds in the landscape, we need to encourage some of the native insects they are used to eating. So many of us have been trying to plant more natives, yet without some knowledge of our local insects, we have no idea whether we are hosting a cabbage moth or swallowtail. In the last three months, I’ve been asked a number of times both by fellow landscaper friends and by clients to give an insect ID for a bug they found on a native. This is definitely a new phenomenon in my circle, and I’ve been enjoying digging out Peter Haggard’s book, Insects of the Pacific Northwest, for answers. 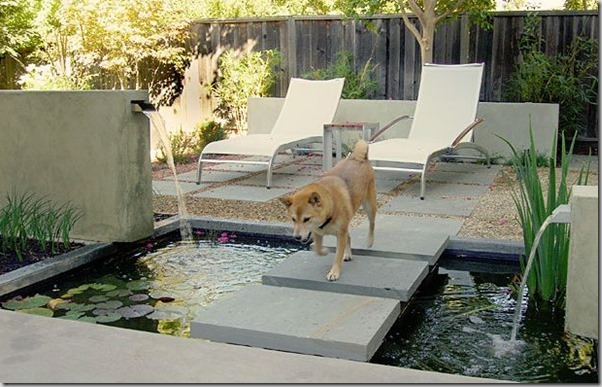 While this isn’t a low-budget trend, I’ve been struck over and over by the number of beautiful water features used as a lawn replacement in small spaces. Most of the examples I’ve seen have had a rectangular or otherwise geometric-shaped pool, and the open surface of the water has the same effect as lawn in terms of providing “negative space”, which allows the garden beds and other landscape features to pop. Though water features take about the same amount of maintenance as a lawn, that maintenance can be hired out to a pond care service just as lawn care can be hired out to the mow and blow guys. There’s an added benefit to a water feature however, in that while a lawn is a total dead zone to wildlife, a water feature, properly constructed with wildlife in mind, has the potential to add greatly to the wildlife interest and biodiversity in your front yard. While this isn’t a trend that I expect to see popping up all over, I do think we’ll be seeing more and more of this in design magazines and high-end neighborhoods. More examples here, here, here, and here. Pinterest has totally changed how people expect to get design inspiration. Nowadays, we all want to see lots of juicy, delicious photos illustrating how other people have done what we want to do. Don’t get me wrong, clear text is still critically important, because once you have some idea of what you want to do, you need to learn in an in-depth way how to go about it and what pitfalls to avoid. But I think the popularity of Pinterest has changed the order in which people get inspired. Now, I start by looking for photographs, then look for the accompanying text which shares why the projects are so effective. If you’re looking for inspiration, try Houzz, which has a way of saving photos to “ideabooks” to keep project inspiration in one place. I hesitate to put this in the trends department, because wildlife gardening, using less lawn, choosing natives, selecting plants that need less water and care, raising chickens, and growing your own food all fall under the sustainability umbrella and all seem to reflect a deeper movement – in other words, it’s not just a trend. But the fact that so many books are being published on these topics right now and people are still learning how to design and garden this way means that it’s a really hot topic at the moment. While I don’t see this movement disappearing anytime soon, at a certain point people will probably slow down talking about it because many of these concepts will become second nature. They’ll fall under the category of regular good design, rather than feeling new in any way. Edibles have been a big trend for some time, but the problem with edible gardening is that a lot can go wrong. You need to water the plants, check on them, pick bugs off or use organic sprays, and plant and harvest at just the right times. It all feels a bit like work, and I don’t know about you, but I already have a job. Cocktail gardening, by contrast, is meant for the cheerfully distracted crew that comes home at dusk each day and just wants to grab a few leaves of something to enhance their nightly tipple. It includes undemanding fruit and herbs which need little fussing, and since you’re mostly growing flavorings or garnishes for your cocktails, not a whole dinner-plate of food, success is a lot easier to achieve. While gardening upwards is still way hot, a number of people have tried out those fussy vertical gardening planters and pockets and had trouble getting their plants to survive more than a season or two. Common sense would tell us that whenever you plant things in a small container, those things are going to need a lot of water, care, and occasional repotting to perform well. It’s the kind of thing I like to see at a restaurant, museum, or other locale where a beautiful art installation like a vertical garden draws visitors and sets the tone. But all that work is kind of exhausting, and most home gardeners don’t have the time for all of that. While simpler forms of vertical gardening like training plants upwards, creating hardscaping features that provide screening, or using tall containers will never go out of style, most gardeners are into projects that don’t need constant revisiting. I will say as a caveat that succulents used for vertical gardening are still pretty popular, and rightfully so. My own experiments doing vertical gardening with succulents have been largely successful, and the plants have survived despite my general gardening philosophy at home of benign neglect. I enjoyed the weird fruit trend thoroughly. While I haven’t planted any medlars or found a good source for blue honeysuckle, we have planted and eaten aronia berries, Chilean guava, Alpine strawberries, black passion fruit and Carolina allspice. 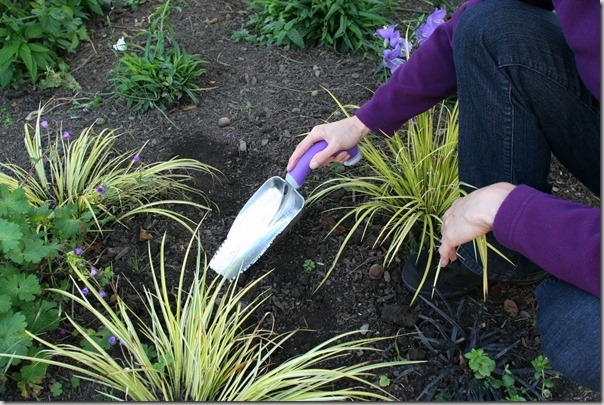 While some of these have been a total hit, I found obvious reasons why these plants are not more commonly used. Alpine strawberries, for example, are absolutely delicious when eaten fresh right off the plants. However, if you pick them into a bowl and try to eat them even 20 minutes later on your pancakes, you’ll find they’ve grown mushy and significantly less appealing – they are a garden-only snack. Our aronia berry makes astringent fruits that are tasty when sugared, but the plant itself has grown about 2 inches in the last two years, and isn’t much to look at. The seeds of black passion fruit are crunchy and unappealing, and while Chilean guava is a fun snack the first time or two, the juniper flavor and leathery skin isn’t something you want to sit down and eat handfuls of. While I’ll certainly continue planting things that fruit or are useful in some way, the days of spending hours pouring over exotic fruit books are over, at least for me. Clients and friends that I’ve spoken with also seem to be feeling the same way. No, no, I’m not saying that succulents are going out of style. Please don’t take away my gardening credentials. All I’m saying is that there are two trends out there right now that really don’t mix. A few months back, I brought home about $150 worth of beautiful succulents and was getting all excited thinking about where exactly in the garden they would go. Unfortunately, Esther, Ethyl, and Beryl, my observant hens, were just as excited to see the crispy snacks I’d brought home for them and began pecking enthusiastically. “Hey – HEY!!! STOP THAT,” I shouted, shooing them vigorously. “Do you know how much those things cost?” A few of my new pretties now had beakmarks along the edges. One succulent groundcover that I’d set out deeper in the garden and forgotten about was later found, eaten to the ground. In fact, a few days later I noticed the ladies congregating around the now-empty pot, taking exploratory pecks at the bare soil, wondering if the tastiness might have returned. If you have chickens in the garden, and you want to play around with succulents, see the aforementioned vertical gardening trend and get those suckers planted up high. What do you think is hot or not in 2013? What trends have I missed? great post….my dream is to have a rustic garden shed that will dual as a greenhouse, shabby escape put in my landscape within the next couple years…sigh, so dreamy! Long time no “speak”. Loved your well-written and organized article. My take is trends come and go like faddy diets to lose weight! If these practices don’t make sense over time in lieu of our life style choices then they “fade” away. I was reminded of the insightful posts by Thomas Ranier, particularly http://landscapeofmeaning.blogspot.com/2012/07/why-i-dont-believe-in-low-maintenance.html where he addresses “low maintenance”. I actually wrote my own post as a result of reading his comments. http://capecod.happeningmag.com/garden-muse-august. I will also echo his mantra “that design matters” and when that is in place our gardening choices have on-going integrity which stands the test of time. I don’t meant to be a party pooper and we can have some fun with trends. Just might try Pantone’s color of the year ( Emerald ) with a container or two and stick a purple trowel in as the focal point! HA. Hugs to you. Stay in touch. Haven’t noticed the insect ID trend in our area, but that’s a trend I’d be willing to follow. Thank you very much for the insights. I’m always looking for innovative ways to make my garden something special, and with the limitations on gardening space, it’s good to read about alternatives such as indoor gardening. I’m a month too old to be a boomer but love the fact that tools are adapting. I still have the long handled dandelion digger I bought 39+ years ago. I’ll have to be on the lookout for these new ones. Great post! If I’d have to predict a future trend it would be mixed or extended season zones. 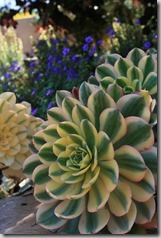 Hybrid greenhouse-like additions might become commonplace. I know I’d do anything (within reason) to enjoy a portion of my garden in the winter. Here in Florida, many homeowners choose to add water features to their landscaping – very popular trend. 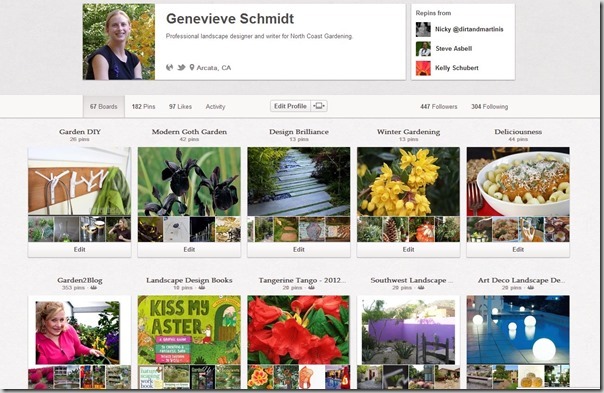 Insightful post and thanks for sharing the Pinterest screenshot…inspiring boards! Most excellent post. I never did get the weird fruit thing, always thought it was best to plant the edibles you are sure to eat. I get offered pineapple guavas by everyone in the neighborhood–no one seems to eat those things. The local garden center does spectacular vertical displays and changes them out every few weeks. No need for me to do that. I enjoy theirs instead since they are so much better at it! Indoor gardening does seem to be coming back, although not exactly like it used to be when everyone crammed their windowsills with houseplants. Is it my imagination or weren’t there entire stores devoted to selling houseplants in the 1970’s? I agree with take on most of these gardening trends Genevieve. I especially agree with you that growing food for ourselves is really a hot topic nowadays. The economy probably has something to do with that. But I am still fan of growing in raised beds and incorporating the concept of vertical growing into those beds when trying to grow a certain type of plant. In my opinion, the biggest trend may be gardening to put food on our own tables in order to save on the food bill, while being able to also know the food is organic.